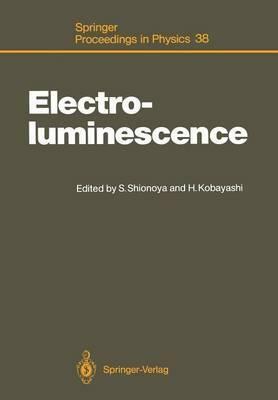 The Fourth International Workshop on Electroluminescence (EL-88) was held at the Hotel Holiday, Tottori, Japan, October 11-14, 1988. This workshop was sponsored by the 125 Research Committee on Mutual Conversion between Light and Electricity, Japan Society for the Promotion of Science, in cooperation with SID (Society for Infonnation Display) Japan Chapter, Tottori Prefecture, the Tot- tori Industrial Technology Association, and the Foundation for Advancement of International Science (FAIS). The workshop EL-88 was a continuation of the series of international work- shops held successively at Liege (Belgium) in 1980, Bad Stuer (DDR) in 1983, and at Wann Springs (Oregon, USA) in 1986. It brought together scientists and engi- neers from universities and industry who shared a common interest in discussing electroluminescence and related topics. The number of participants reached 253; 49 from abroad (10 countries) and 204 from Japan. This is almost four times as many as in the previous workshop in 1986, reflecting the recent rapid development and progress of electroluminescence research. Illustrations note XV, 396 p.
I Opening Invited Paper.- Retrospect and Prospect on Research and Development of Electroluminescent Panels.- II Basic Physics.- Developments in the Theory of Electroluminescence Mechanisms.- Auger Effect in Semiconductors: Why Does It Matter for Electroluminescence?.- The Impact Cross Section of Electroluminescence Centers.- Impact Excitation Cross Section in Electroluminescence.- Electroluminescent Mechanisms of Rare-Earth-Doped ZnS Thin Films.- Time Resolved Emission Spectra in ZnS Thin Film Electroluminescent Devices.- Excitation Mechanism Based on Field-Induced Delocalization of Luminescent Centers in CaS:Eu2+ and SrS:Ce3+ Thin-Film Electroluminescent Devices.- Excitation Mechanism in White-Light Emitting SrS:Pr, K and SrS:Ce, K, Eu Thin-Film Electroluminescent Devices.- Novel Step Impact Electroluminescent Devices.- Preparation of a Low Voltage ZnS Thin Film Electroluminescent Device Using Injection of Hot Electrons into the Emitting Layer.- III Luminescence Characteristics and Materials.- Secondary Light Output from ZnS:Mn Thin Film Electroluminescent Devices.- Thermally Stimulated Currents in Thin Film Electroluminescent Devices.- Measurement of Trap Levels in Electroluminescent Devices by Photon-Released Residual Charges.- Influence of the Mn Concentration and the Level of Excitation on Efficiency of ZnS:Mn Devices.- Characterization of Isolated Mn2+ Ions in ZnS:Mn Thin Film.- Bound-Excitonic Emissions in Undoped and Mn-Doped ZnS Single Crystals.- About the Microstructure of Luminescent Centers in SiOx and ZnS Films Doped with Tb and Mn Fluorides.- On the Stability of Rare Earth Centers in II-VI Compounds.- The Relation of Thin Film Electroluminescence and Photoluminescence Excitation Spectra.- The Dependence of Near Band Edge Electro- and Photoluminescence on Purity of Starting Materials in ZnSe Crystals.- Photoluminescence of Zinc-Sulfo-Selenide Single Crystals Grown by Sublimation Method.- CdS-ZnS Superlattice Electroluminescent Device Prepared by Hot Wall Epitaxy.- An Electroluminescent Device Using Sintered Manganese-Doped Zinc Sulfide Phosphor Ceramics.- Role of Sulfur Vacancies in Luminescence of Pure CaS.- Structural Disorders in Gd2O2S:Tb Phosphors.- IV Color Electroluminescence.- Thin Film Electroluminescent Phosphors for Patterned Full-Color Displays.- The TbOF Complex Center and the Brightness of ZnS Thin-Film Green Electroluminescent Devices.- Doping Conditions of Tb, F Luminescent Centers in ZnS: Tb, F Films - Effects of Fabrication Methods on Doping Conditions.- Effects of Preparation and Operation Conditions on Electroluminescence Spectra of ZnS:TbF3 Film Structures.- Green AC Electroluminescence in ZnS Thin Films Doped with Tb, Er and Ho Ions and Concentration Quenching Models.- Pulse-Excited Characteristics of Electroluminescent Device Based on ZnS:Tb, F Thin Films.- AC Electroluminescence of Ho-Implanted ZnS Thin Films.- High-Luminance ZnS:Sm, F Thin-Film Electroluminescent Devices Using Ferroelectric PbTiO3 Thin-Film.- Electroluminescent Devices With CaS:Eu2+ Active Layer Grown by R. F. Reactive Sputtering.- Improvement in Electro-Optical Characteristics of CaS:Eu Electroluminescent Devices.- ZnS-like Behaviour of Efficient CaS:Eu Electroluminescent Devices.- Bright SrS TFEL Devices Prepared by Multi-Source Deposition.- Sulphur Defects and Deep Levels in SrS:Ce Thin Films.- Sr1-x Znx S:Ce, F Phosphor for Thin Film Electroluminescent Device.- SrSe:Ce Thin Film Electroluminescent Device.- Electroluminescence of Rare-Earth Activated SrS Thin-Films.- Multi-Color Electroluminescent Devices Utilizing SrS:Pr, Ce Phosphor Layers and Color Filters.- V Processing Technology.- Electroluminescent Materials Grown by Atomic Layer Epitaxy.- The Role of Chemical Vapour Deposition in the Fabrication of High Field Electroluminescent Displays.- Multi-Source Deposition Method for ZnS and SrS Thin-Film Electroluminescent Devices.- Efficient ZnS:Mn Electroluminescent Films Grown by Metal Organic Chemical Vapor Deposition.- Chemical Vapor Deposition of Thin Films for ACEL.- AC Thin-Film ZnS:Mn Electroluminescent Device Prepared by Intense Pulsed Ion Beam Evaporation.- VI Thin Film Electroluminescent Panels.- Review of Flat Panel Displays: Electroluminescent Displays, Liquid Crystal Displays, Plasma Displays, etc.- Design Rules for Thin Film Electroluminescent Display Panels.- Power Consumption of Thin-Film Electroluminescent Matrix Display.- TFEL Matrix Display Design Rules Based on a 3 Part Electrical Model.- Degradation Processes in Thin Film Electroluminescent Devices.- ZnS:Mn Electroluminescent Devices with High Performance Using SiO2/Ta2O5/SiO2 Insulating Layer.- Thin Film Photoconductor-Electroluminescent Memory Display Devices.- Tunable Color Electroluminescence Display Operated by Pulse Code Modulation.- Optical Behaviour of Electroluminescent Devices.- Current Filaments in ZnS:Mn DC Thin Film Electroluminescent Devices.- Cathode-Zinc Sulphide Barrier Heights and Electron Injection in Direct Current Thin Film Electroluminescent Devices.- Low Voltage Driven Electroluminescent Devices with Manganese-Doped Zinc Sulfide Thin Film Emitting Layer Grown on Insulating Ceramics by Metal Organic Chemical Vapor Deposition.- Sound Emitting Thin Film Electroluminescent Devices Using Piezoelectric Ceramics as Insulating Layer.- Characteristics of ZnO:Al Transparent Conductive Films.- Recent Developments and Trends in Thin-Film Electroluminescent Display Drivers.- Bidirectional Push-Pull Symmetric Driving Method of Thin Film Electroluminescent Display.- VII Powder Electroluminescent Panels.- Analysis of the Lifetime of Powder Electroluminescent Phosphors.- On the Mechanism of "Forming" and Degradation in DCEL Panels.- Application of Sol-Gel Technique to the Preparation of AC Powder Electroluminescent Device.- Multicolor ac-Electroluminescent Display Panel Using Red Electroluminescent Phosphors.- Electroluminescence in Calcium Sulphide.- VIII Light Emitting Diodes.- Organic Electroluminescent Diodes.- Electroluminescence in Vacuum-Deposited Organic Thin Films.- Conductivity Control of ZnSe Grown by Metalorganic Vapor Phase Epitaxy and Its Application for Injection Electroluminescence.- Characteristics of an Efficient ZnS Blue Light-Emitting Diode with a High-Resistivity ZnS Layer Grown by Metalorganic-Chemical-Vapour-Deposition.- Electron Injection and Electroluminescence in Graded II-VI Compound Hetero-Junctions.- Free Exciton Emission in ZnSxSe1-x. MIS Diodes with High Pulse Current Density.- Electroluminescence of ZnSe:Mn MS Diodes in the High Electric Field.- Photo- and Electro-Luminescence of Rare Earth (Er, Yb)-Doped GaAs and InP Grown by Metalorganic Chemical Vapor Deposition.- Ultraviolet Light-Emitting Diode of Cubic Boron Nitride PN Junction.- Electroluminescence Spectrum of Manganese-Doped CuAlS2.- Index of Contributors.